Fathom Events, TCM and Tristar Pictures bring Glory to select cinemas nationwide for a special 30th anniversary showing for two days only and includes exclusive insight from Turner Classic Movies. 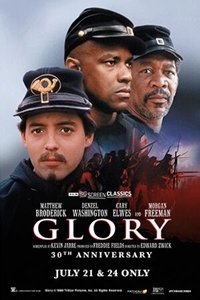 The heart-stopping story of the first black regiment to fight for the North in the Civil War, GLORY stars Matthew Broderick, Denzel Washington, Cary Elwes and Morgan Freeman. Broderick and Elwes are the idealistic young Bostonians who lead the regiment; Freeman is the inspirational sergeant who unites the troops; and Denzel Washington, in an Oscar®- winning performance (1989, Best Supporting Actor), is a runaway slave who embodies the indomitable spirit of the 54th Regiment of Massachusetts.